Tooth loss affects more than your smile, it also causes structural oral health issues that cannot be resolved with traditional restorations. At the Masters Institute of Implants & Periodontics in St. Louis, Dr. George Duello replaces teeth from the root up with dental implants. Unlike traditional dentures that are temporarily attached, we provide permanent and reliable solutions for tooth loss, no matter how many teeth patients are missing. If you want to learn more about dental implants and how they are a viable teeth replacement option, call us today. You can also schedule a consultation to see if this advanced treatment is your ticket to a new smile. Teeth and the roots that support them are integral to overall oral health. The jaw supplies strength, allowing you to chew properly, while roots reinforce the bone. When teeth are knocked out or extracted, the jaw loses an important biological connection and begins to shrink, weakening the arch. Teeth can also shift into the gaps, making for an uneven smile and contributing to malocclusion. It may take up to a year for this effect to have adverse effects on daily health, but timely treatment can halt the advance of these dental problems. Implant-supported bridges are dental prosthetics that renew your dental function using advanced materials and procedures. When patients are missing two or more teeth, Masters Institute of Implants & Periodontics provides every step of care to fill those gaps. Traditional bridges and partials do not address the base issue of bone health, but implant-supported restorations both preserve existing tissue and encourage renewed strength. With implants, Dr. Duello and his team can prevent the development of new health complications and pave the way for an enhanced smile. This conservative and comprehensive treatment is the best option for correcting extensive tooth loss, where many patients believe removable dentures are their only choice. It is our mission to expand our patients’ teeth replacement opportunities and restore the stability of a full smile. 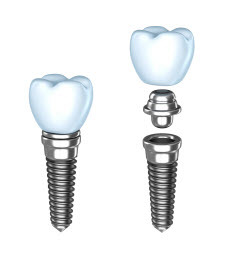 We take care of the whole implant placement process, from planning treatment to delivering care. We first make sure your jaw is strong enough to support implants before placing them, as insufficient jaw density sometimes necessitates preparatory procedures. Once we can confirm the expected outcome of your procedure, we will place implants and restore them with a customized appliance. These restorative prosthetics are permanent and designed to last. Implants are made to supply reliable function for 25 years or more, while implant partial dentures can last just as long. With routine dental visits and a discipline hygiene routine, patients can safeguard their new smile for a lifetime of use. Our practice has helped many patients have complete smiles again. With Dr. Duello’s expertise and our state-of-the-art treatments, you can have a smile that looks and feels natural. Call our St. Louis implant and periodontal practice today!